Internationally acclaimed Chinese artist Qiu Zhijie’s enormous five-storey wall painting Map of Technological Ethics 2018, has its origins in Chinese ink painting and calligraphy. Inspired while gazing across the Brisbane River, the map is influenced by Brisbane’s combination of ecological paradise and its technological integration. 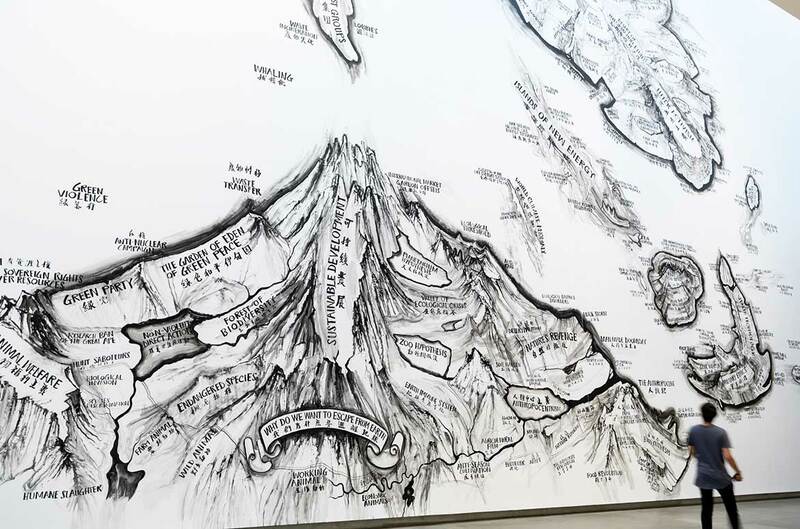 Painted directly on to the gallery wall, 18 metres in height and 38 metres long, the map depicts an archipelago of moral quandaries in applied science. Islands and landmarks are named for activists and political lobbies, contentious issues in medicine and biology, and looming fears of technocracy and anthropogenic climate change. Watch our time-lapse of Map of Technological Ethics, recorded over a period of five days, or visit the Gallery of Modern Art (GOMA) and take time to absorb Qiu Zhijie’s largest map produced from either the ground level, or the Pavilion Walk on level 3, one of the highlights of ‘The Asia Pacific Triennial of Contemporary Art’ (APT9). Watch our time-lapse as Qiu Zhijie creates Map of Technological Ethics 2018 especially conceived for GOMA’s expansive long gallery. Qiu Zhijie touches on the implications of artificial intelligence and computer technologies, from the impact of automation on labour to the use of facial recognition software in drone warfare. Assigning imagined geographies to a range of expressions of ethical anxiety throughout history and across cultures, Qiu suggests expanded possibilities for established categories of knowledge. In the sheer scale and breadth of his map, he offers a graphical account of the potential for technology and its conundrums to pervade every aspect of human life. Map of Technological Ethics – rendered straight on the wall of GOMA for the duration of ‘The Asia Pacific Triennial of Contemporary Art (APT9) – is an expression of Qiu Zhijie’s multidisciplinary, trans-historical approach to art making, which teases open the social, moral and legal implications of scientific development. Qiu Zhijie discusses his art practice while in Brisbane to create Map of Technological Ethics 2018 especially conceived for GOMA’s expansive spaces. Aisha Khalid is one of a generation of artists from Pakistan who have transformed the tradition of miniature painting into an internationally celebrated form of contemporary art. 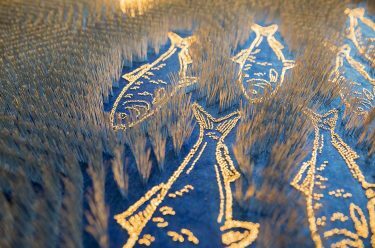 These large-scale hanging tapestries, embedded with thousands of long, gold-plated pins, employ Khalid’s foundational skills and show the confident hand of a miniaturist, together with her sensitive understanding of pattern making and her love of textiles. Read about Qiu Zhijie and Aisha Khalid in The 9th Asia Pacific Triennial of Contemporary Art available online or in store. 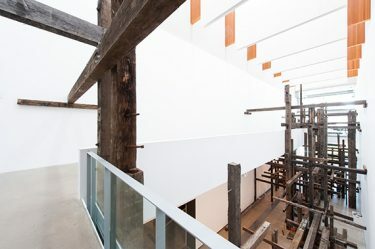 The publication represents an important and lasting document of the current artistic landscape of Asia and the Pacific..